The use of LED Grow Lights in indoor, hydroponics and greenhouse cultivation combines environmentally friendly aspects, financial savings including better growth, quicker harvest cycles and high yield. For the last decade, in the indoor gardening industry, high-intensity discharge (HID) lamps are used for artificial light generation. Although HID lamps were originally developed for street lighting, they provided good results in the indoor cultivation. Back in the days they were the only lighting systems with a sufficient amount of photosynthetically active radiation (PAR). In particular, HID lamps emit wavelengths far outside the range of 400-700 nanometers (nm) of photosynthetically active radiation. An average of more than 50% of the emitted light of an HID lamp cannot be absorbed by the plants. The inefficient radiation generates tremendous heat in the infrared range and is useless for plant's photosynthesis. In fact, too much heat stresses the plants and inhibts photosynthesis. The generated heat is also the main driver for high energy costs related to HID: the inefficiency of the lamp is one aspect. The need for energy-consuming climate devices, such as cooltubes or air conditioning is not always considered when using HID's. Fluorescent bulbs and tubes provide good results for vegetative growth, but are not strong enough for the flowering due to the low intensity. Nevertheless, the biggest disadvantage of these systems is that the color spectrum of the light is not optimal for best indoor plant growth results. 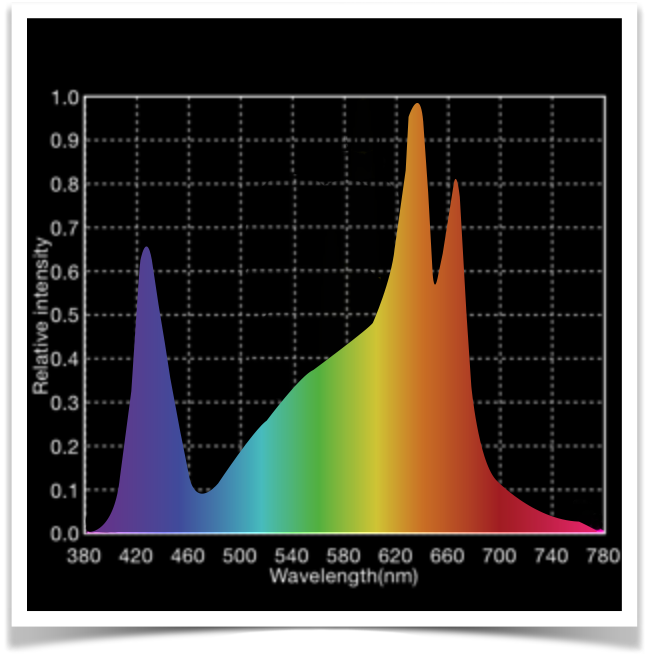 Traditional light sources do not provide the intensity of the PAR wavelengths that are key for effective photosynthesis and of the plant's hormone production. Plants grow best under light in the blue, green and red wavelenghts of the visible light spectrum. If you would like to better understand why the light spectrum has an enormous impact on your plant's photosynthesis, please keep on reading here. 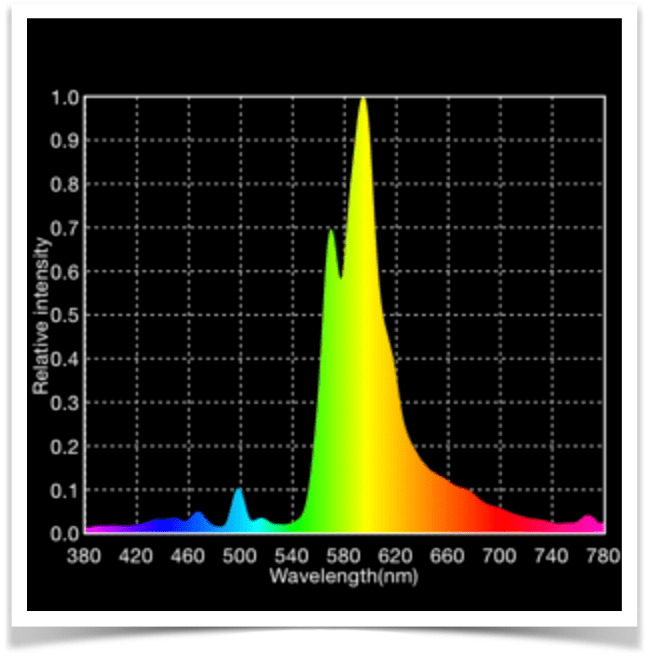 The spectral measurements listed below show a conventional HID lamp (for flowering) and the Grow Light Spectrum. 25% higher light absorption and 15% higher yield: our tests with LED indoor plants comparing to HID. The harvest cycle is accelerated by 15-20%, using LED Grow Lights. The light spectrum is specifically tailored to flowering plants light and is suitable for all life stages. Use your excite Grow Light for vegetative, growth, flowering and cloning. LED Grow Lights produce higher intensity than HID lamps, while consuming half of the energy. The excite dimming and spectrum programming gives you additional potential for more power savings (and higher yields). excite Grow Lights have a lifespan of 50.000h and are maintenance-free for a minimum of 8 years, when running on a daily 16h-schedule. No need to replace costly and ineffective bulbs anymore. Photosynthetic processes are stimulated far more effective. Your plants are healthier and produce higher dry yield of better quality with LED Grow Lights. excite Grow Lights are flexible, so you can distribute the light source over you canopy much more effectively to illuminate all your plants. The innovative control allows to customize all modules with the touch of a button. Lower heat means less cooling, water and fertilizer. The result: No burnt plants while saving money and resources. excite Grow Lights are 100% recyclable and do not contain toxic substances, such as mercury. The RoHS certification is a must for every quality LED Grow Light. LED Grow Lights do not need any heavy and unneccessary ballasts. Just plug in your Grow Light and start secure.